Riley is my snacker. That child could live on snack foods alone! We have what we call "Riley's Snack Drawer" in our house. He is thin, and we don't restrict his eating. When we received a box of Mrs. Freshley's Snack Cakes, Riley immediately opened every package and dumped them into his drawer, claiming them as his. I was able to wrangle a few out to try before he started in on them! My favorites were the Oatmeal Cremes. Soft, chewy cookies with the perfect amount of cream in the center. Riley said his favorites were the Mini Donuts, and he finished them in 2 days! I have to admit to buying other brands of these snacks, but these are WAY better. Better texture and taste. The Honey Bun was really good after microwaving it for a few seconds and adding some butter :). You can “like” Mrs Freshleys on Facebook to keep up with the latest products and promotions! You can also check out all the Mrs. Freshley's varieties here. 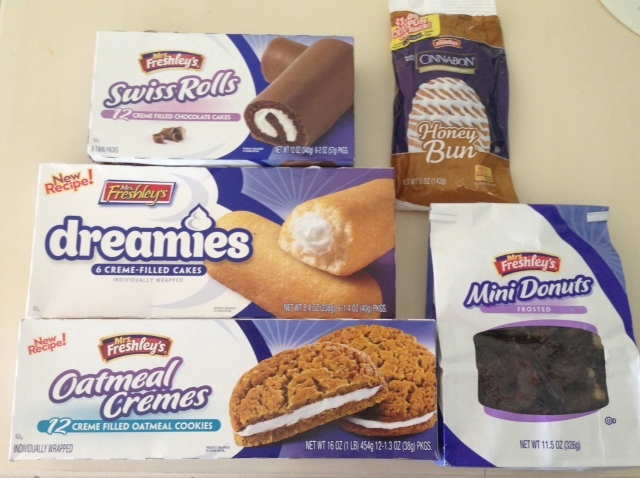 One reader is going to win $50 worth of Mrs Freshley's FREE item coupons! Enter using the rafflecopter form below. I want to try the Bar Cakes. Either the Raspberry Creme Filled cakes or the Honey Buns. I'd love to try the Fruit Pies! Chocolate Chip Muffins look yummy! Oh these look so yummy. I'd love to try their apple pies. I would like the Fudge Brownie. I would like to try the Fudge Brownie. I would love to try the Snowballs. The Cinnabon Cinnamon Coffee Cake. I want to try the "Buddy Bars". I want to try the Fudge Brownies. I would pick the danish variety! I want to try the glazed honey bun. The oatmeal creme cookies are my favorite! I would like to try their Cinnamon Mini Donuts. I'd like to try the Cherry Cheese Danish. The Cinnamon Danish looks tasty. I like the apple Danish. The honey buns are my husbands favorite. The Cinnamon & Sweet Rolls! The fruit pies sound good. The Fudge Brownies look yummy. I would like to try the Berry Fruit Pie. Buddy Bars are the best! I;d like to try the fudge brownie. I would love to try the Cinnamon Coffee Cake. I would like to try the snowballs. I would love to try the fruit pies!! Chocolate Chip Muffins make my toes curl! I would like to try the Chocolate Fruit Pies. My family loves the Buddy Bars. Thanks for the giveaway. I would like to try the Fudge Brownies! YUMMMY! I want to try the Banana Pudding Cakes.